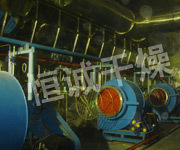 Description: Fluidizing drier is also called as fluidized-bed. It consists of air filter , heater ,fluidized-bed main machine, feeder , cyclone separator , cloth bag duster ,high-pressure centrifuge fan and operation table. Because the properties of raw materials exist dif ference, when equip the dust removing equipment, it should consider the practical need. separator only for raw material that is large in specific gravity and cloth bag dusterfor powder and small granule raw materials that is light in specific gravity .Meanwhile there is air feeding device and belt conveyor for selection. 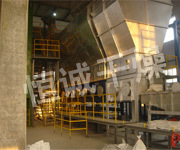 Separated granule solid raw material is fed into fluidized-bed drier through feeder. 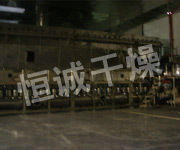 Fresh air through filtering and heating is sent to the bottom of fluidized-bed by fan and contacts with solid raw material on distributing plate. In this way the fluidized state is formed and the heat exchange between air and solid is carried out. The dried raw material is discharged from outlet and wasted gas is exhausted from the top of fluidized-bed where catches solid powder through cyclone separator , cloth bag duster . 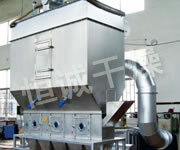 Steam, electricity or hot air furnace can be used (it can be supplied as request). The clean and hot air enters into fluid bed through distributor of valve plate.The wet material is fed from the feeder forms the fluid state by hot air .Because of the wide contact between hot air and raw materials, the time of drying is short. If use continuous type, the material enters from the front of bed, fluidized in bed for several minutes, and float another side of bed. Themachine works in negative pressure. 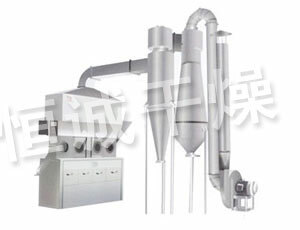 ◎Drying process of medicines, chemical raw material, foodstuf f, grain processing, feed and so on. For example, raw medicine, tablet, Chinese medicine, foodstuf f of health protection, drinks, feed, resin, citric acid and other powders. The suitable diameter of raw material is normally 0.1-0.6mm.The most applicable diameter of raw material will be 0.5-3mm. ◎The fan may be installed outdoor or in the special noise free room. The plan can be adjusted slightly in accordance with the re al conditions.